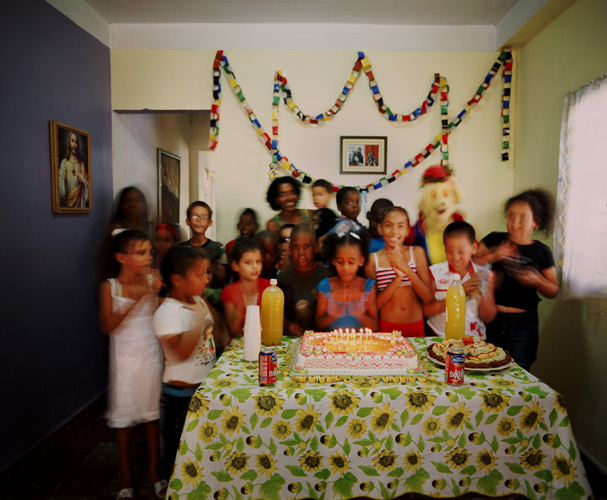 December 26, 2009, I had been in Havana for four days, wondering the streets, seeing my friends, and just celebrated Christmas with one of my cuban families. It was quite a different holiday celebration; relaxing, tranquil, and distant from the western consumerism that I am use to with its post holiday sales. My morning was spent drinking coffee and making breakfast for a whole family, a traditional, American Christmas breakfast, or at least a traditional, American Christmas breakfast residing within my childhood memories, yet, made with cuban ingredients. When I first arrived, Billy had invited me, on Saturday, the day after Christmas, to his friends house, whose daughter was celebrating her birthday. I was reluctant to be a participatant or a photographer at this event, thinking to myself, “I want to relax, go to the beach, especially the day after Christmas, one of the days in the year that I can actually do so,” but explaining this to a cuban, didn’t make sense to him, few things western do, especially the mentality of wanting to rest the day after Christmas. A few days prior, Billy keeps reminding me to show up at his house, early Saturday morning, western time, not cuban time, as he sometimes stresses, and telling me that we need to leave by 9 AM. I show up at 10 AM, too lazy to crawl out of bed, I was worried that I was late. Once I arrive his house, Billy exclaims, “good morning my friend, coffee?” And I asked him if we still have time? He exclaimed, once more, “You’re right on time.” I felt dubiously tricked and outsmarted. We chatted for a bit, over coffee and a cuban breakfast of rice and black beans with a little bit of chicken. He further commented that we have a long way to go, on the outskirts of Havana, in the province of Cotorro, Havana, and that we will be there most of the day. It was a part of Havana that I have never seen before, or even knew that it existed. I was intrigued by the houses and the people that were living there; so close to the main city of Havana Del Este, yet so far away at the same time. It would be a frustrating commute if you lived here, and had to commute into the city everyday; as buses are sporadic and as cuban taxis are expensive, and few and far between. We finally arrive to our destination, Billy finally explains that he wanted me to photograph a little girl’s birthday party; explaining how she has never had her portrait taken, and the family would be quite grateful if I would document this event for them. It was a beautiful day, not a hot cuban summer day, but a mild, sometimes chilly, San Francisco fall day, with a slight cold breeze; it was a northerner from the intense winter North America was having, interrupting their normal tropical climate. I was introduced to Daniella, the birthday girl, excited about her day and her party that her parents arranged for her: complete with decorations, lunch, party favors, clowns, and a Pinata. The whole day, you could see in her eyes, her enthusiasm and her excitement. In the bedroom, next to the living room, in front of the house, I heard a loud, constant moaning, not a person in anguish, or of a person in pain, but perhaps of loneliness. I inquired as to where the sound was coming from, and Daniella responded, “mi abuelo, Alberto.” Her father, introduced me to him, and I later asked, if I may photograph him. He asked his father, explaining who I was, and that I have traveled a long distance to be here. He agreed. Once I began to photograph, he stopped moaning, pausing to look at me from time to time. Unfortunately, I could sense he was near death, although he did not seem to be in too much pain. It was the same sensation I experienced as my grandmother moved closer and closer to her passing: in and out of consciousness, the moaning, as if she were remembering and longing for a time that existed in her youth, as my grandmother explained to me in between her moans. I felt uncomfortable at times, photographing him when he probably did not feel like himself, yet every time I moved out of the room, or away from his sight, away from his presence, he would begin to moan once more. I took this as a sign that he was comfortable with my presence, my camera, and that I was not interrupting his peace. This was later confirmed when his son and daughter-in-law moved him into the kitchen to have lunch. I raised my camera, and he moaned once more, nodding, back and forth, aware of my presence, and understanding how he did not want to be photographed. 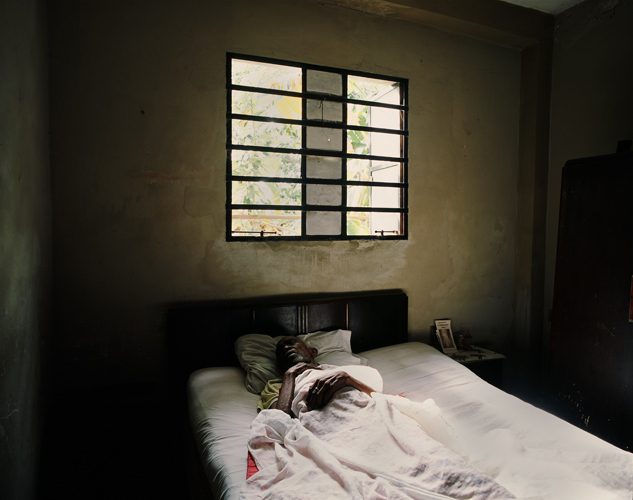 Alberto Hernandez lived 86 years, living most of his life, in the Pinar Del Rio provence of Cuba. He passed away in late January of this year. And it was amazing to see how this family was celebrating life, by celebrating their daughter’s seventh birthday, and at the same time celebrating the life of Daniella’s grandfather. Wow, what beautiful work! I’m an amateur myself, and very inspired after visiting here. Thank you for these images and words. Thank you for your kind words, and I am quite honored you feel inspired after viewing this blog. When you have time please check back as this site will always be a work in progress. Recently, I added several new categories to the Page section, and I will filling in the blanks over the month or two. You are currently reading Daniella’s Birthday Party And Her Grandfather, Alberto at Unguided Tour.